Contaminated fish, sediment and water can be dangerous to one’s health but that doesn’t keep hungry Chicagoans away from the water at Canal Park and the Canal Port River Walk on Ashland Avenue south of Cermak Avenue in the Pilsen neighborhood. In years past, factories and slaughterhouses used to dump waste in the Chicago River and the canals which connect to it. That contaminated the water and the fish. Pilsen’s coal plant, Fisk, contributes contamination to the water also. It releases lead, mercury, and other contaminants into the air which fall into the river. Since President Richard Nixon signed the Clean Water Act and Clean Air Act in the early 1970s, factories can’t dump waste right into the river and there are limits on what plants and factories can emit into the air. But there is still a strong possibility of water contamination in the Chicago River because the City of Chicago discharges its sewage into the river, about 1.2 billion gallons every day. The sewage and other industrial waste is only partially treated. Starting in 2014, it will be disinfected to kill viruses and bacteria but right now, that is not done. In 2011, the national group American Rivers named the Chicago River one of the country’s 10 Most Endangered Rivers. And yet people still fish there. We visited the area where the Chicago River meets the Chicago Sanitary and Ship Canal at Canal Park on a muggy afternoon in early August. Near a grove of huge trees, I met Scott, a 34-year-old man who asked his last name not be used and who regularly fishes in the shallow, calm water flowing through this spot. I asked him some questions about river contamination and previous factory dumps. “I’m not for sure if it’s contaminated but I love coming here for the scenery and I love fishing,” said Scott. A coal-fired power plant in the Pilsen neighborhood. Photo by Kari Lydersen. On May 11, angry and disappointed residents gathered at Casa Aztlan in Pilsen to hear about the risks from the Fisk coal plant and the H. Kramer brass smelter in their neighborhood. Forty deaths a year and 550 emergency room visits are caused by Fisk and the city’s other coal plant in Little Village, according to the Harvard School of Public Health. The coal plants were “grandfathered” in under the Clean Air Act that was signed in 1970. Grandfathered means it’s been there for a long time so it doesn’t have to equal up to the same standards as coal plants built these days. Now a law is proposed that 25 aldermen are supporting which could force the power plants to shut down. The group Pilsen Environmental Rights and Reform Organization (PERRO) is trying to pass the ordinance. At the meeting, residents said Ald. Danny Solis should stick to his promises since he won the run-off election in April after promising he would shut down the coal plants, or force them to clean up their emissions. People at the meeting loudly questioned why Solis was not there personally and yelled at the representative he had sent, Steve Stults. They were treating him badly because they didn’t want him there, they wanted the alderman. Raker said Solis could not attend because of a scheduling conflict but is very committed to the issue. Stacy Raker, a spokesperson for Solis, said the alderman will definitely keep his promise and that the ordinance will be reintroduced in City Council on July 28. In a recent attempt to shut down a coal-fired electric plant in the Pilsen neighborhood, Kelly Mitchell and seven others climbed up a 450-foot smoke stack on May 24. Several youth journalists and I got a chance to interview the 26-year-old Mitchell at Yang’s Chinese Restaurant in the South Loop in view of the smoke stack. She discussed the story behind the Fisk coal plant and the thrilling climb and how she and her colleagues survived. 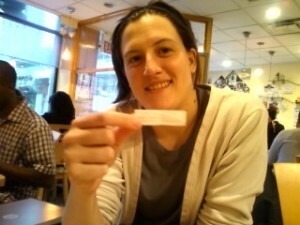 Greenpeace activist Kelly Mitchell reads her fortune. Photo by Tyreshia Black. Mitchell and her team were arrested and charged with felony property damage. They had to attend a court hearing and Mitchell told us that the maximum sentence she could serve would be seven years. Five men and three women (including Mitchell) stayed up on the smoke stack for 26 hours. They survived with only Cliffbar nutrition bars and bottled water. They used hiking tools to reach each of the platforms on the smoke stack. I wondered how was it possible to do such a thing? “All of us did that type of climbing before so we were experienced and knew how to use the equipment,” said Mitchell. 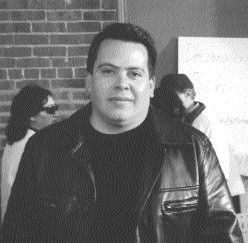 On April 26, 2005 the Pilsen Alliance and the residents of the Pilsen community held a press conference in front of the now defunct Lerner Box Company, an industrial building on 16th Street and Carpenter. They were marching, picketing and protesting the Lipe Property Company. If you were anywhere near 16th and Carpenter that Tuesday night, you would have heard the shouting and chanting voices of men, women and a lot of young people, bellowing these words of protest: “Familias Si, Condos No” (Families Yes, Condos No). Two years ago, the Chicago Housing Authority proposed to renovate all of the senior citizen buildings. It’s now 2004 and the restoration is nearly finished. At Las America Racine Apartments, a senior building located Southwest of downtown in the Pilsen neighborhood, CHA hasn’t finished yet. Here’s a partial list of work that has been done. The outside walls of the building have been scraped and tuck pointed. Contractors have rejuvenated the roof and the front yard, removing the old brick walkways and replacing them with new concrete sidewalk paths. The brick wall that was in the front of the yard on the west side of the building near the sidewalk was removed. They put in twelve new benches and planted five new trees. The grinding and the scraping and all of the other irritating noises and clouds of white dust that surrounded the building has ceased.